The sheep farmer near Bathgate, Scotland dyes his sheep with nontoxic dye to entertain passing motorists. This photo was taken by Cooldawg: Katy Buxton from the UK and posted on Deviant Art. Teresa Raleigh found this and pinned it on her Pinterest page. She has lots of interesting pins. 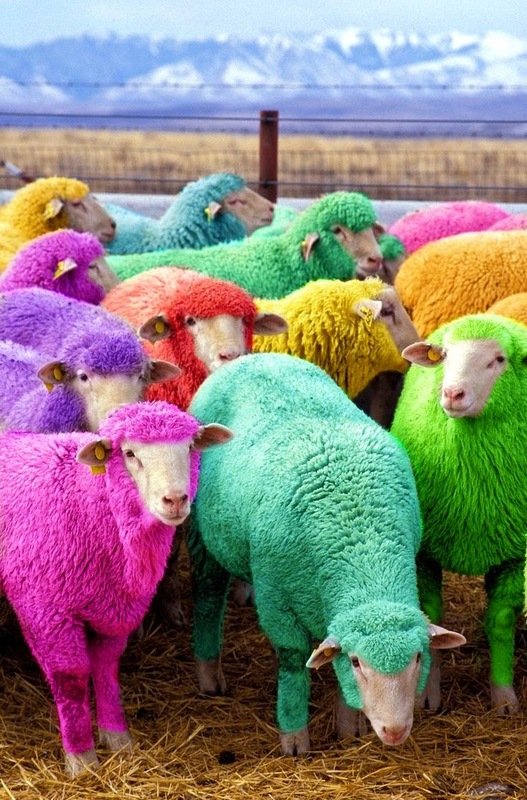 Love these colorful sheep! That farmer must be a fun fellow. Your Blog is great! I'll come back! Thanks for the great shout-out! What a fun surprise to see my Pinterest board featured on your blog this morning :*) Love your blog -thanks for all the wonderful inspiration! I LOVE them!! How fun is that? Haha, I don't think I've ever posted about someone's Pinterest boards before, but Teresa's are exceptional. That's one way to tell those sheep apart! Graffiti Quilt - Almost Finished!